XCom: Enemy Unknown Lead Designer Jake Solomon says the game will feature permadeath, a "classic" difficult mode, strategic base building and even the gentle touch of Sid Meier himself. For old-time X-Com fans, the announcement of XCom: Enemy Unknown was a double-edged sword. Excitement over the thought of a new XCom strategy title was tempered by fears that a push for "accessibility" would turn it into Plants vs. Zombies from outer space. But according to Jake Solomon, the lead designer on the project, there's nothing to fear. It's not a physics-based game so entire buildings can't be brought down, but walls and environmental "scenery items" will be destructible. At the easiest difficulty the game will "do its best to make sure you don't fail," but soldiers killed in combat will stay dead and the highest difficulty level, called "Classic," will apparently be very difficult indeed. Base activities, like research and scanning for UFOs, will still happen in real-time, but in one notable change the tactical combat sequences will not be based on time units. "Time units are a great mechanic, but the player spends too much time thinking about that system," Solomon told PC Gamer. "We want to add so much to XCom - classes, perks, a ton of new weapons and a cover system and new mission objectives - and you cannot add that much stuff without making sure everything in there is carrying its weight." And while the original X-Com creators are not involved in the project, Firaxis Creative Director Sid Meier, who knows a thing or two about making strategy games, has his finger on the pulse. "He and I interact on an almost daily basis," Solomon said. "I say 'Look, I have this problem. What do you think I should do?' and he's a very gifted designer. He can look at a situation and he can say, 'Have you tried this?' And I'll be like, 'Oh, that's really good.' I claim all the credit for it, but I rely on him so much. I'm now to the point where I can basically hear his voice in my head, which is probably not healthy. He tells me to hurt people." 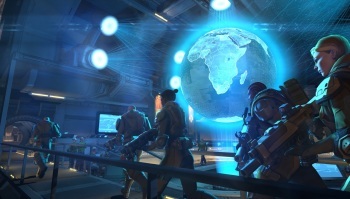 XCom: Enemy Unknown is due out later this year for the Xbox 360, PlayStation 3 and PC.